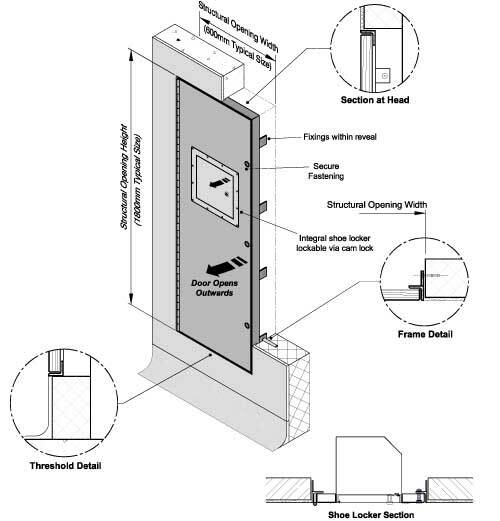 Door leaf is constructed from a solid timber core sheeted on front face and all edges with 1.6mm thick zintec steel skin giving a finished door thickness of 40mm. Door leaf is mounted within a 50mm x 50mm x 6mm rolled steel angle frame and is hung from a substantial continuous hinge. Supplied as standard with three allen key socket head bolts for secure fastening. 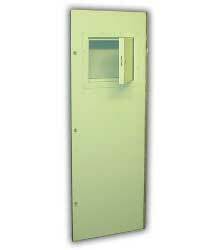 Integral shoe locker constructed from 2mm pressed mild steel box and frame c/w 1.6mm pressed door cover secured by a cam lock. Frame can be provided without threshold for “full height” doors. 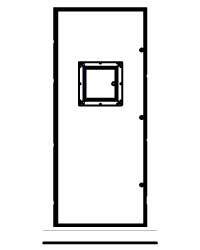 Door leaf secured by deadlocks or cam locks in lieu of standard secure fasteners. Can be supplied without shoe lockers.